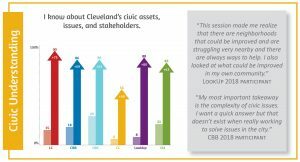 The Cleveland Leadership Center’s evaluation process was developed as a systemic, sustainable approach to gain an understanding of how CLC programs impact participants. 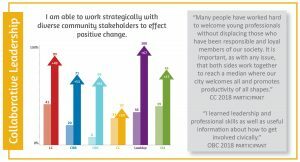 Evaluation informs the ongoing design of the organization’s offerings to optimize efforts to create a continuum of committed community leaders in Cleveland. Cleveland Leadership Center program curricula are designed to achieve the four clearly defined guiding framework outcomes, which are collectively aimed at achieving the organization’s mission. 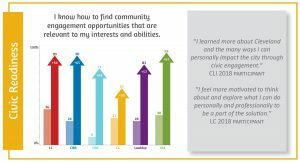 CLC started this work in 2012 as a means to understand the organization’s impact on individuals and in the community, and to inform areas for growth and improvement. In the first phase of the work, a program evaluation rubric was designed and instituted across all programs. In the second phase, the organization’s impact on the community was explored. CLC uses a retrospective pre-test (RPT) built around these four pillars to evaluate the impact of its programs. Participants rate their knowledge, attitude, and skills at the end of their program compared to before the program across 16 questions. The charts within each accordion below indicate the percentage of participants who agreed or strongly agreed with specific outcome-related indicators before the program (pastel bars) and after the program (dark color bars). Last year, all programs showed double-digit percentage point increases across all 16 indicators. In addition to the immediate effects CLC programs have on participants, CLC has also investigated the long-term learning and behaviors resulting from participation in CLC programs. This was done by examining current alumni involvement and behaviors in their professional organizations and in their community involvement to determine if they intersect with the four guiding framework outcomes. 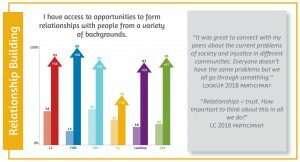 This exploration also defined the lasting impact CLC programming has on participants, organizations and the community and provided insight into long-term behavioral effects of alumni in the community. Below is a brief (1:12 minute) video highlighting some of the findings. You can also read the full report. Are you interested in learning more about CLC’s impact and evaluation work? Contact Rachel Ciomcia below or call (216) 592-2280. I believe my connection to Cleveland is permanently enhanced. I no longer expect to be a passive citizen of Cleveland, recognizing that I must contribute in a collaborative way to make it a better place.